I have thin brows, they weren’t always that way though. I have been in the process of letting them grow out for the wedding since my last visit to my favorite little eyebrow lady. She accidently swiped off to much on one side, but oh well it is hair and it will grow back. Anyway, I have been having to fill my brows in more than usual so I felt like I needed something to ensure, I didn’t give someone a hug one day and half my brow wiped off. I have seen things like that happen before to other people so I don’t want to take any chances. 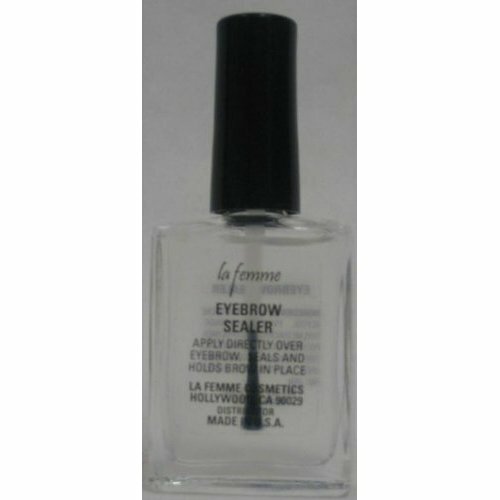 I ordered the La Femme eyebrow sealer from Makeup mania about three weeks ago. I think it was only about 5 bucks. Well this stuff really works. At firtst I was scared to use the liquid over my drawn in pencil brows thinking it would move the brow somehow. I was wrong, I applied two coats to each eyebrow. I then let it dry down completley. It didn’t take long maybe 1-2 minutes. After the dry down, I rubbed my finger lightly across the brow. Nothing came off at all. I then did it again with a heavier hand and all I got was a small dark spot on my finger, BUT my eyebrow looked perfectly fine and intact. Once I run out of this, I will definitely be purchasing again.